The Jolly Mountain Fire burned across more than 36,000 acres, spreading through thick underbrush and torching dense and diseased forests. Hundreds of homeowners in Ronald and Roslyn were put on evacuation alert. One of those homeowners was me, Darcy Batura. I was prepping my family and home to evacuate as fire swept across the forest The Nature Conservancy manages in the region. Hundreds of firefighters arrived from around the country in August 2017 to fight the blaze and dig miles of fire line. Air tankers dropped fire retardant on the parched land to halt the inferno. We can’t know for sure, but we do know what helps to prevent the most catastrophic damage from wildfires: Healthier, more resilient forests, well-informed communities taking action and better-equipped firefighters. Under the leadership of Washington’s Commissioner of Public Lands Hilary Franz, our Department of Natural Resources has an ambitious vision to fund this critical forest and community resilience work. It’s now up to the Legislature to provide the funding to make this vision a reality. A bill introduced in the Senate Thursday would generate $125 million per biennium for forest health and wildfire prevention, enabling investment at a scale to meet the problem. As years of record-breaking fires over the last decade demonstrate, Western forests and communities in and around them are in crisis. Suppression of natural fire and past forest-management practices have left our iconic forests with dense stands and unnatural undergrowth that make them ripe for uncharacteristically severe wildfire. Longer fire seasons with warming temperatures and less-predictable precipitation patterns in a changing climate increase the vulnerability to fire. Washington’s forests are central to our food and water supply, jobs and culture. Forests capture, clean and cool our water, fueling our $49 billion food and agricultural industry and supporting spawning salmon. Forests are at the heart of our $26 billion outdoor recreation industry. They’re central to the cultural history and practices of people who have lived here for millennia. They are also essential for reducing the devastating carbon pollution that poisons our air, as trees are instrumental in capturing and storing that carbon. Without strong state funding for forest restoration, we risk losing all these benefits and more. The good news is that with proper funding, we can protect our forests — and the people who make their homes and livelihoods within them — from the risk of catastrophic fire. The Nature Conservancy’s scientists spent two years researching our region’s greatest needs for forest restoration. The findings informed the Department of Natural Resources’ 20 Year Forest Health Strategic Plan, which itself was the result of more than 30 organizations’ contributions to a shared vision and goals across all vulnerable lands. 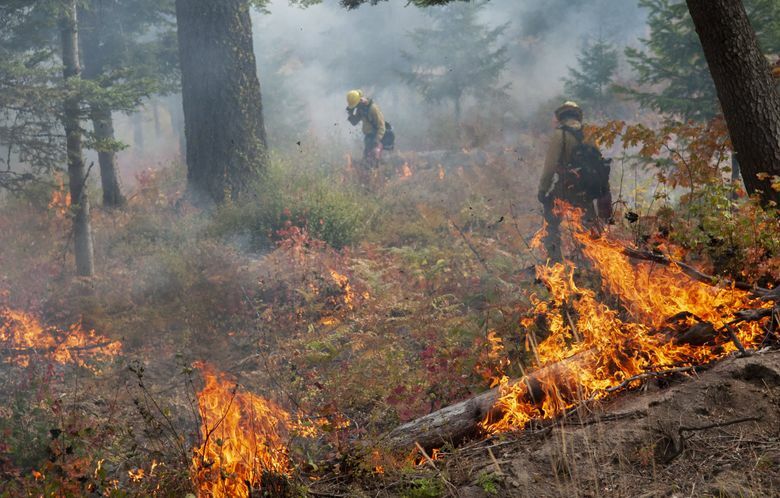 The plan calls for restoration thinning, prescribed fire to clear out unnatural undergrowth that contributes to wildfire, community engagement, better training and stronger cross-agency collaboration. In our roles as a firefighter and a conservationist, we have walked hundreds of miles through our state’s forests. We have marveled at the beauty and wonder of healthy landscapes, and we have studied with great concern forests that are damaged and at higher risk of wildfire. We also have seen the impact of community engagement, restoration and collaboration. Multiple case studies across the West demonstrate that active restoration with thinning and controlled burning slows wildfire spread, increasing firefighter effectiveness and safety and leaving green forests. While the scope of restoring forest health is huge, we know it is essential for community preparedness and for protecting precious natural resources. This vital investment will not be cheap, but the cost of inaction is much higher. Action becomes even more urgent as the impacts of climate change increase. Forest management and reforestation were identified as two of the most potent natural solutions to climate change, in a collaborative study by The Nature Conservancy and partners. The report showed that maximizing the potential of forest management across the U.S. would be like taking 145 million cars off the road every year. Here in Washington, where half of our total land is forested, forests are critical tools in the fight against climate change. Today’s urgency presents an opportunity: we have an unprecedented opportunity to invest boldly in our future. Washington’s natural resources are at the heart of our prosperity, identity and continued ability to thrive. We can let it all slip away, or we can act today and shape a safer and more vibrant tomorrow. Darcy Batura is the forest partnerships manager for The Nature Conservancy in Washington, lives in Roslyn, and prepped her home and family for evacuation during the Jolly Mountain Fire. Kevin Curfman is president of Washington Contract Firefighters and recently retired from a 30-year career as a structural firefighter. He volunteers as a firefighter/EMT on his local department and owns a wildland suppression business. This year he had engines on the Miriam and Tillman Surprise fires in Washington as well as on fires in other states.